►A table number makes finding a table very easy for guests. Assigned seats give guests the chance to mingle with other guests with whom they'd be a good fit, as well as make your guests feel more welcomed. ►It is also helpful for dismissing tables to the buffet line at dinner or for waited service to keep track of requests at specific tables. ❤100% original design and exquisite craftsmanship with high quality materials. Every attention to details reflects a kind of pursuit of perfection. ❤Rustic and classic style, their pretty and elegant looking are the little details that can really make your big day stand out from all the rest. Soft color and calligraphy English number is just the right decoration adding the rustic touch to the wedding tables. ❤Sturdy enough to stand on wedding tables and very easy to spot for guests from a distance,so they are also suit for outdoor wedding and party. ❤Nice quality and durable for next big event: anniversary, annual dinner, baby one-birthday party and other special celebration. PLEASE NOTE: The colors of these series of table numbers may appear different or less natural way than the actual color of the merchandise itself when viewed on your computer monitor or cellphone screen. And the wood grain may vary very slightly of each table number. We will keep trying to make every effort to present you the original characters of our products, hopefully it will works better. Size: Each table number wooden cards measures 4" (Tall) x 4 3/4" (Wide) , base measures 2 1/4" (Length）x 2" (Wide). 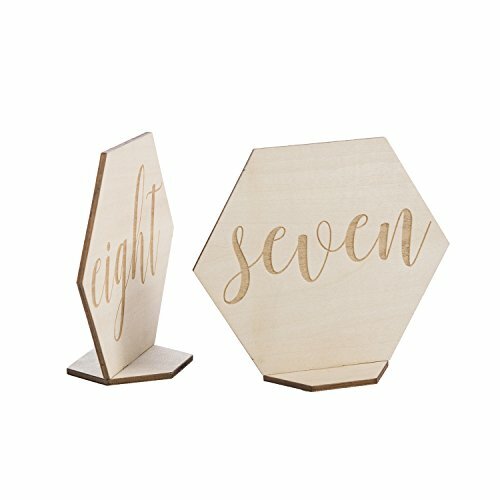 Package: Including 15 natural wooden table number pieces ( Numbered 1 through 15), it has hexagon base, can be easily put on the guest tables. The numbers will fit into the base that can stay standing on their own. There is no need to glue to the bases. ORIGINAL DESIGN: 100% original design, carefully select each plank, double-sided laser calligraphy English numbers, hexagon diamond shape hand-packed. DIVERSE USE: Any occasion you need table numbers to guide the guest, not only in wedding days but also annual party,birthday party, dinner, restaurants and cafe shop and so on. GORGEOUS CHOICE: When the color tones of your autumn wedding is maples, burnt orange, tangerine or pumpkin, it's a good match with our wood-colored table numbers. They are low-key but unique, will work for weddings having rustic, fine art, and vintage themes seamlessly!